This article contains solution of problem card no detected already exist in the software database. › Why am I getting error message "The card no. 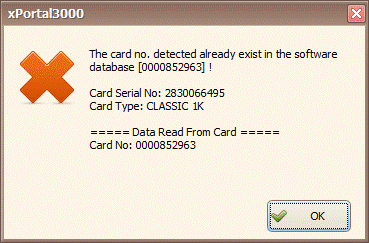 detected already exist in the software database" when trying to add Card Serial No.? › Pop up message as shown below will be shown. › The Card No. is already assigned to other staff. To solve this problem, please use other Card No that is yet to be programmed. Summary: This article contains solution of problem card no detected already exist in the software database. How to use Card Serial No? How to setup Mifare Card Options Programming Mode to Read and Write Card No?